Colombia’s President Ivan Duque appears to have isolated himself internationally after ending peace talks with the ELN and demanding that host country Cuba arrest rebel peace negotiators. During a United Nations Security Council meeting on Wednesday, Colombia’s Foreign Minister Carlos Holmes Trujillo failed to receive any support to end peace talks. 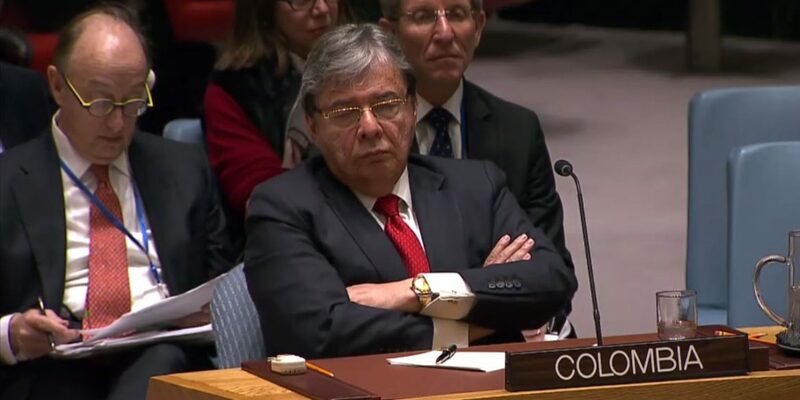 Duque and Trujillo have been telling the Colombian people that Cuba must extradite peace negotiators and that this was supported by the international community, but this was not confirmed by any member of the security council. The security council members unanimously rejected the ELN’s car bomb attack on the General Santander police academy in Bogota, but none expressed support to end the talks or arrest peace negotiators. Germany’s representative at the UN urged the Colombian government to reconsider its decision to end talks. The tragic events of late last week in Bogota remind us once again of the urgency of ending violence and persevering in efforts to ensure a more peaceful future for all Colombians. Trujillo refused to answer reporters’ questions about the ELN peace talks. Foreign reporters were also unable to question him on Monday during a press conference in which he claimed to enjoy international support for reactivating the armed conflict with the country’s last-standing guerrilla group. What do the guarantor countries say? Norway said Tuesday that it rejected the attack, but that its government would not break its commitment as guarantor for the peace talks. This commitment includes the signatories’ obligation to return ELN peace negotiators to their troops in Colombia if Duque decides to formalize the rupture of the talks. The government of Chile, which is also a guarantor country, said it supported the Colombian government to “bring those responsible for this heinous terrorist act to justice,” but would not confirm the Colombian government’s claim that peace negotiators were involved in the attack. Duque’s refusal to either resume or end peace talks could mean that ELN leaders can remain in Cuba while the talks are on hold, opening the possibility of international diplomatic intervention.